Amelia Bedelia is the protagonist and title character of a series of American children’s books written by Peggy Parish until her death in 1988, and by her nephew Herman Parish beginning in 1995. The books have been illustrated by Wallace Tripp, Fritz Siebel, and the two current illustrators, Lynn Sweat and Lynne Avril. In 1992 HarperCollins republished the three original Amelia Bedelia books: Amelia Bedelia, Amelia Bedelia and the Surprise Shower, and Thank You, Amelia Bedelia with illustrations by Barbara Siebel Thomas, daughter of the original illustrator Fritz Siebel. 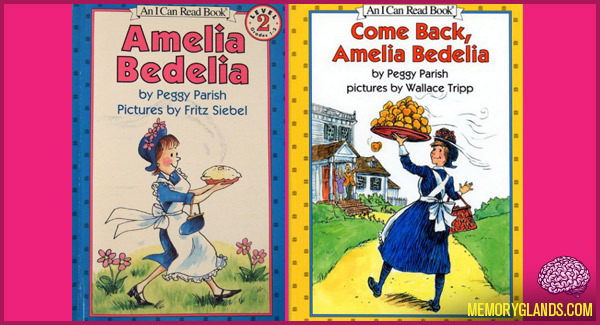 “Amelia Bedelia” was based on a maid in Cameroon, where the author spent some time during her formative years. Her vast collection of hats, notorious for their extensive plumage, inspired her to write an assortment of tales based on her experiences in North Africa. Some of the stories involve Amelia repeatedly misunderstanding various commands of her employer by always taking figures of speech and various terminology literally, causing her to perform wrong actions with comical effect. However, she almost always manages to win everyone over at the end of the book by baking an (apparently delicious) pie or cake. Beginning in 2009, Herman Parish is now writing books about Amelia Bedelia’s own childhood experiences, starting with Amelia Bedelia’s First Day of School. There is a statue of Amelia Bedelia in Manning, South Carolina, the hometown of author Peggy Parish.